ALD’s Software Suite is a result of 24 years of expertise in development of Safety and Reliability analysis software for many of the world leading civil & military aviation, communication, space and electronics organizations including THALES, BAE Systems, Lockheed Martin, NASA, MBDA, SAGEM and more. RAM Commander is the pioneering Reliability and Safety software for reliability professionals and design engineers. RAM Commander combines ingenuity of approach, calculation accuracy, convenience of use. Designed by reliability engineers, RAM Commander covers the entire scope of engineering tasks related to reliability of electronic, electro-mechanical and mechanical systems. RAM Commander is modular software allowing a customer the flexibility of gradual addition of the modules to the package in accordance with the requirements of a project or the budget constraints. List of RAM Commander modules contains Reliability, Maintainability, RBD, Fault Tree Analysis, Event Tree Analysis, Safety Assessment, Spare Parts optimization, Derating, FMECA and Testability Analysis, Process&Design FMEA and more. FRACAS (FavoWeb) is ALD’s third generation, web based and user configurable Failure Reporting, Analysis and Corrective Action System (FRACAS). It captures information about equipment or the processes throughout its life cycle, from design, production testing, and customers support. FavoWeb FRACAS has been adopted by world leading organizations who have been able to implement for the first time ever, a FRACAS application which seamlessly communicates with any given ERP system (SAP, ORACLE, MFGpro etc), while proving a user friendly, flexible yet robust failure management, analysis and corrective action platform. Life Cycle Cost (LCC) analysis and Total Cost of Ownership evaluation are the basis for decision making for the wide range of industries and equipment: from IT systems to submarines. LCC analyzes the total ownership costs of various design alternatives and system’s components over the projected life cycle of a system. D-LCC (Decision by Life Cycle Cost) makes the LCC analysis easy and comprehensive. 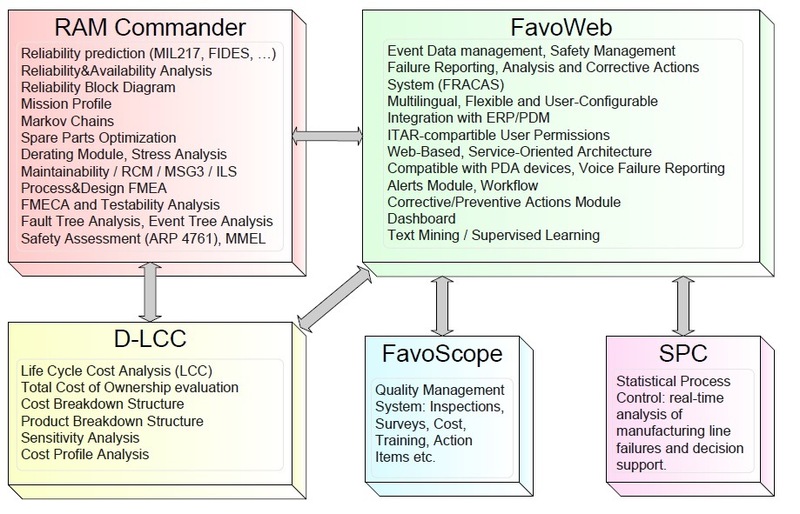 D-LCC is a key tool for managers, decision-makers, engineers, ILS personnel, and other staff involved in system acquisition, proposal writing, management, development, production and through-life support. The ALD College Course Management Software System for Colleges and Educational Institutions is designed to help Colleges and Educational Institutions manage and implement courses. The software includes modules for teaching content, assigning lecturers to appropriate courses, monitoring and controlling teaching aids, monitor teaching hours and the utilization of classrooms, supervising income and expenses, planning and controlling the logistics activities related to the courses given. Different reports can be generated by ALDCOLLEGE software. Favoscope Quality Management System is a web-based audit system for quality process management based on ISO requirements including management of inspections, surveys, costs, training, action items, corrective actions etc. The system is user configurable allowing easy and fast tailoring to the organization’s specific needs/process.